Great sadness and deep affection marked the recent passing of Prof. Narendra Nath Wig, the renowned and much-loved psychiatrist, who devoted his life and career to bettering the lives of mentally ill. His soul departed heavenly abode on Thursday, July 12, 2018, at the age of 88 following brief ailment, in the precincts of the same institute where he served for so many years. He was unwell since November 2017, after he suffered a mild cardiac arrest. His health started deteriorating after that. He was born on October 1, 1930, in the West Punjab district of Gujranwala, then United India. He was heartbroken after the departure of his wife Mrs. Veena Wig a couple of years ago. They were a warm, gracious, and generous couple. He was not the same person after his wife's demise. He was popularly known as the father of psychiatry. He founded the Psychiatry Department, Postgraduate Institute of Medical Education and Research (PGIMER), in 1963 and headed the department till 1980. He used to love working and even at this age, he used to work for 3 days at the CMC Hospital and would run his charity clinic for 2 days in Lajpat Rai Bhavan for over 20 years and treated over 30,000 patients having mental health problems. He is survived by two sons – Siddhartha Wig, who is an architect and used to stay in Panchkula with Dr. N.N. Wig, and Anish Wig, who stays in Switzerland. 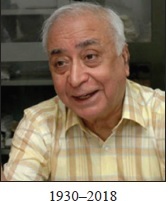 Dr. Wig completed his MBBS from KG Medical College, Lucknow, in 1953, and MD Medicine from Lucknow University in 1957. He pursued his interest by training at the All India Institute of Mental Health (now National Institute of Mental Health and Neuro Sciences), Bengaluru. On his return, he joined the Medical College at Lucknow as a lecturer in neuropsychiatry. It is here that he started the first general hospital psychiatry unit in India. His contribution to psychiatry is in two major areas: the first one is giving concept of Dhat syndrome and saw that it is included in the WHOs International Statistical Classification of Disease-10 classification and the second Hanuman Complex for strengthening the ego in psychotherapy. He also holds a double diploma in psychological medicine – one from England and another from Scotland. He was a fellow of India's prestigious National Academy of Medical Sciences. In 1991, the Royal College of Psychiatrists, London, honored him with the highest award of the Honorary Fellowship of the College, FRC Psych. In 1976, the department got international recognition as the WHO Collaborating Centre for training and research in mental health. Among his various research studies, Prof. Wig will be particularly remembered for his work in community mental health in the villages of Raipur Rani Block in Haryana, which became a model of primary mental health-care program in India and in many other countries. In 1980, Prof. Wig moved to the All India Institute of Medical Sciences, New Delhi, as Professor and Head of the Department. In 1984, he joined the World Health Organization as the Regional Advisor, Mental Health, and remained at Alexandria, Egypt, till 1990. In this capacity, he was responsible for developing mental health programs in 22 countries, from Pakistan to Morocco in the Middle East and North Africa. Dr. Wig was passionately fond of Urdu poetry, especially Ghalib; besides other things, he took interest in many things such as watching birds in fields, stars in the sky, Urdu poetry, and music, both classical and popular. In October 2000, on his 70th birthday, a book titled Mental Health in India 1950–2000 was published in his honor in which many leading national and international mental health experts who were his students wrote various chapters. I wrote on hospital psychiatry in that book. Again in October 2010, on his 80th birthday, his sons published another book on Journey Ahead depicting various photographs. In September 2004, Fountain House, Psychiatric Centre at Lahore, Pakistan, named a newly constructed building as Prof. N.N. Wig Unit, in recognition of his services to the development of mental health in the countries of South Asia. I was Dr. Wig's student in PGIMER from 1976 until 1979. I later left for the UK in 1992. He was instrumental in bringing me to Mahatma Gandhi Institute of Medical Sciences (MGIMS) Sewagram, Wardha, in 1996, where I stayed for 15 years and commenced first MD and DPM in Vidarbha region in 2005. He was the then member of Kasturba Health Society (KHS) and came to Sewagram in 1998 in KHS meeting and told that he only came to see me and my wife Mani (she worked under him for many years in the WHO projects). He also then visited newly constructed building psychiatry department and showed great satisfaction. During recent World Social Psychiatry Conference in New Delhi, I visited him in Chandigarh on December 1, 2016. He told me that we are sailing in the same boat, as I lost my wife Mrs. Mani Behere in 2016. He was so happy that his student became the first vice chancellor of a university (D.Y. Patil University, Kolhapur). We had then lunch together. He wrote forward for my three books. The last forward he wrote for my book before his death entitled “Clinical Psychopharmacology: An Update,” will be published by Springer, and coming out in the next few months. Dr. Wig's departure has left a great void in my heart and in hearts of many of his students and world. He was exceptional in many ways. He was a mentor and a teacher in the true sense. He was very caring even when his students left PGIMER.